"Endquote: Sots-Art Literature and Soviet Grand Style" by Marina Balina, Nancy Condee et al. Sots-art, the mock use of the Soviet ideological cliches of mass culture, originated in Soviet nonconformist art of the early 1970s. In literature, Sots-art stands out as one of the most distinct directions in late-twentieth-century Russian culture both in its explicit aesthetic confrontation with Soviet history and in its capacity, after many decades of socialist realism, to integrate Russian literature back into the world literary process. Sots-art has had a profound influence on contemporary Russian literature, figuring both as distinct texts and as a range of citational devices within larger, more diverse works; yet despite its centrality, Sots-art in literature has not been systematically studied, either in Russia or in the West. 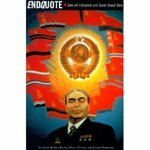 Endquote: Sots-art Literature and Soviet Grand Style begins that process with an examination of literary Sots-art on several levels. Balina, Marina; Condee, Nancy; and Dobrenko, Evgeny, "Endquote: Sots-Art Literature and Soviet Grand Style" (1999). IWU Authors Bookshelf. 33.